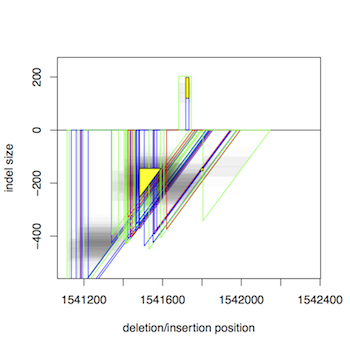 This tool to detect structural variations is specifically designed to cluster short-read paired-end data into possibly overlapping predictions for deletions and insertions. The method does not make any assumptions on the composition of the data, such as the number of samples, heterogeneity, polyploidy, etc. Taking paired ends mapped to a reference genome as input, it iteratively merges mappings to clusters based on a similarity score that takes both the putative location and size of an indel into account.